First thing you’ll notice about the Snow Leopard is how extremely lightweight it is, weighing in at only 2.1 ounces, or 61 grams. Holy cow! That’s ultralight! The cup I’m using is a TOAKS 600ml titanium cup. It weighs 3.8 ounces itself, so the total weight of the entire cook kit is less than six ounces. The Snow Leopard is designed to fit down inside whatever cup you’re using, by the way. It’s all self contained, like an alcohol version of the Jetboil. With this system, you’ll get a small heat shield, a stove which weighs only .75 ounces and holds 1.2 ounces of fuel, a 4 inch high windscreen that weighs 1.4 ounces, a measuring cup that holds a little over 1 ounce, and 2 pins that hold the screen together. These pins have tiny insulated tubing on one end to keep you from burning your fingers. The windscreen wraps around into a tube, and the pins hold the screen in place and serve to rest your cup on. It took me some practice to get the windscreen to hold together with the pins in a way that keeps them from slipping out of place. Do it a few times and it’ll get a lot easier. To get the windscreen to fit your cup well, you may have to bend down the tabs up top just a little. It shouldn’t stick to your cup when you try to remove it from the heat. The snow leopard windscreen fits a ton of different sized mugs. They have a list on their website to help you figure out which stove setup you should get, although navigating the site can be a little tricky. (Jon, the owner, is working on updating the site to make it a bit more user friendly, which is great news.) I think they’d do well to have a link to those lists on the side somewhere, rather than having to search for them. IS LISTING BOIL TIMES EVEN WORTH THE TROUBLE? Okay, so what about boil times? Well, if you’ve ever messed with alcohol stoves, you already know that environment temps affect how long it takes for a certain amount of water to boil. I originally had the boil time for two cups of water in ‘mild’ weather in the review video. After using this stove so many times where the environmental temps varied from near freezing to near hellfire, and produced different boil time results every time, I just edited that segment out. It doesn’t do many people much good to know how long it takes to boil a cup of water on a summer morning if they are headed to the mountains with snow in the forecast. 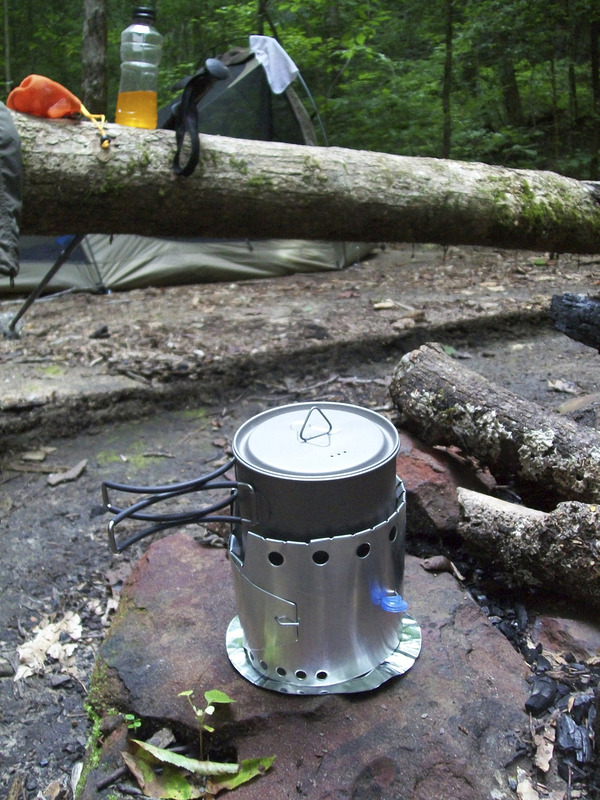 I know boil times are the money shot of backpacking stoves for a lot of people, but I didn’t see how the information I previously provided would help anyway. If you can try to heat up a cup of lukewarm water and cold water while it’s 70 degrees outside and they’ll both have different boil times, so I just edited that out of the video. Doesn’t seem to really help at all, in my opinion. You can use denatured alcohol as fuel for this stove, like most other stoves. I use HEET for fuel, the stuff in the yellow bottle. You can get it just about anywhere that sells automotive parts. I like to carry my fuel in a small plastic bottle, with a flip and pour top. I prefer a 4oz bottle, minimum. Also, I keep a small 2″ x 2″ square sponge in my kit, to help clean my cup. Overall, I really like this stove. The TOAKS mug isn’t very big, but the fact that the Snow Leopard can fit down inside of it, is a real bonus. Also, it weighs nearly nothing. And, since there are no moving parts, you don’t have to worry about it malfunctioning, like with a canister stove. I bought some material to make a Reflectix cozy for my ti cup. I think I’m gonna start carrying my cook kit like this, to do one pot cooking, rather than carrying a larger ‘envelope’ style freezer bag cooking cozy. Flat Cat makes several other types of cooking setups, as well accessories such as a solid (tablet) fuel burner for simmering and baking. They also make a stove (the Iso-Clean) that burns rubbing alcohol cleanly, with little to no soot. (Updated:) I wrote this review and did the video several months ago. Since then, I have started using solid fuel tablets (Esbit) more and more often. The weight savings over alcohol are noticeable and I don’t have to worry about knocking over the alcohol and catching myself on fire. I’ve been using my Epicurean stove from FCG for cooking, although the Epicurean was developed for baking as well as full throttle water boiling. The epicurean stove sets down inside the Snow Leopard windscreen and works just fine. I was given a FCG ‘Focus Fire’ solid fuel stove by Chad, of Stick’s Blog, and I plan to put it use soon. I really like cooking with Esbit tablets over alcohol now and fortunately, Flat Cat Gear makes several types of stoves for use with Esbit tablets. Look for reviews on more FCG stoves in the near future. Check out their site at http://www.flatcatgear.com. Categories: Cooking, reviews | Tags: cooking, reviews | Permalink.